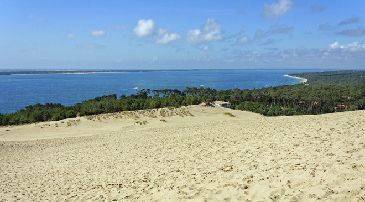 Located in the beautiful Vendee region of western France, on the Atlantic coast, Saint Jean de Monts is the ideal holiday location for those wanting to explore the outdoors. There is a huge range of activities available, as well as plenty of opportunities for visitors to simply relax. A fishing village dating back to the middle ages, Saint Jean de Monts offers visitors pretty architecture steeped in fascinating history paired with modern buildings, comfortable accommodation and gorgeous views. The beaches offer plenty of water sports as well as relaxing, tranquil days spent soaking up the sun, and there is also golf and other sports on offer. Summer France offers guests a choice of the best accommodation in the area, with cottages sleeping from four to six people, and villas sleeping up to eight. All of the accommodation is within easy reach of the Atlantic coastline, as well as offering guests access to the wide range of activities which can be found in the local area. Saint Jean de Monts is the ideal place for those looking to enjoy activities in the outdoors. There are beaches to be explored, as well as historic sites and attractions and surrounding forests, with plenty of opportunities to get outside and be active, whether travelling as a group of friends, as a couple, solo or with the whole family. The beaches are the main attraction in Saint Jean de Monts, with plenty to choose from, including the Plage des Demoiselles, which enjoys plentiful sunshine due to its southerly location, the Grande Plage with its vibrant promenade and cycle paths, the Plage de la Parée du Jonc where guests can enjoy tranquillity as well as plenty of other beaches. Saint Jean de Monts beaches are gently sloping, with constant lifeguards in the summer, allowing families to enjoy beach days with absolutely no stress. A range of water sports are on offer, including surfing, kite surfing, sailing and sand sailing. With a long history dating back to the middle ages guests will find plenty of historic sites and attractions to explore in the town. The original 15th-century granite church stands in the middle of the old town and is worth a visit, along with the 13th-century belfry tower, allowing guests to explore the region’s rich past. Those wanting to enjoy some shopping will find a selection of boutiques and souvenir shops in the town as well as along the promenade. Outdoor activities include fishing in the sea, canoeing, cycling, horse riding and hiking. Pick a direction and take off across the beaches and dunes, or take a specific path through the woods, or try the barefoot walking path, which sees brave walkers traversing unknown terrain with bare feet and a blindfold on! A very short walk, it comes with a guidebook so walkers can find out what they were walking on after they’ve finished. There is also a tree top adventure course winding through the forest, ideal for those travelling with the family, and those wanting to relax can enjoy a trip to the Thalassotherapy spa. 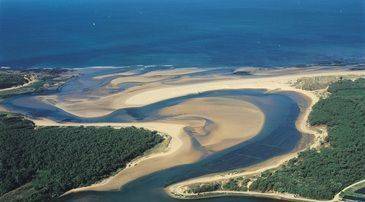 Saint Hilaire de Riez is located in the Vendee region, where you’ll find some incredible dishes and delicacies available. The town is home to fishermen bringing in their catch of the day, with fish going from boat to restaurant in the same day. Visitors can enjoy a range of local favourites, including freshly caught clams and shellfish, as well as bass and sole. The market is open on Thursdays and Sundays, allowing guests to pick the freshest ingredients from farms in the local area, ideal for those wanting to self cater. The Les Mas de Saint Hilaire offers guests a range of cottages, sleeping from four to six people. The central area has a clean swimming pool ideal for sunbathing and little ones wanting to splash about, while the cottages themselves are clean and bright. Guests can enjoy light open spaces and modern interior décor, along with vibrant furnishings during their stay here.